Inflammatory myopathies are acquired, treatable autoimmune diseases, characterized clinically by weakness and soreness of muscles and elevated CK and pathologically by myonecrosis and mononuclear inflammatory infiltrates. An important feature of inflammatory myopathies is the expression of HLA-1 (MHC-1) by myofibers. Normally, MHC-1 is expressed in muscle capillaries but not in myofibers. In inflammatory myopathies, MHC-1 is expressed in the sarcolemma and sarcoplasm of all myofibers, even if there is no inflammation. 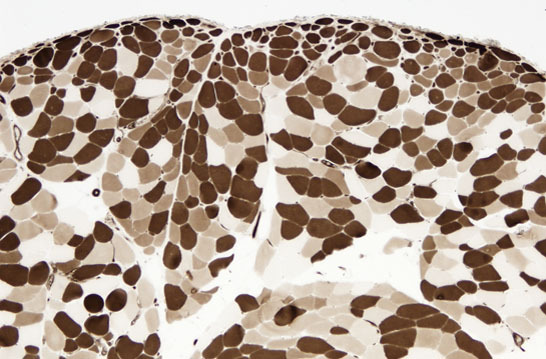 MHC-1 expression is also seen in some muscular dystrophies. More muscle biopsies are done for diagnosis of inflammatory myopathy than for any other category of muscle disease. The main inflammatory myopathies are polymyositis, dermatomyositis, and inclusion body myositis. Polymyositis. Lymphocytes invade a myofiber. Polymyositis. 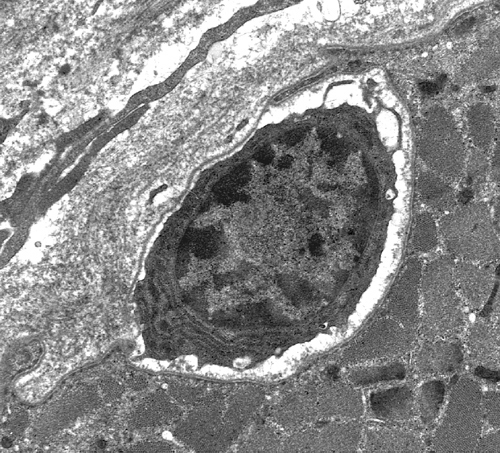 Lymphocyte penetrating under the basement membrane of a myofiber. Polymyositis affects predominantly adults who present with proximal weakness (without a rash),developing over a period of weeks or months. 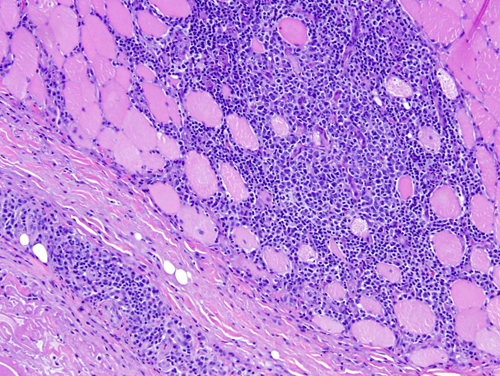 The muscle biopsy shows endomysial mononuclear cells and myonecrosis. Polymyositis is a cell-mediated autoimmune disorder in which cytotoxic (CD8-positive) lymphocytes and macrophages invade and destroy myofibers expressing MHC-I antigens. 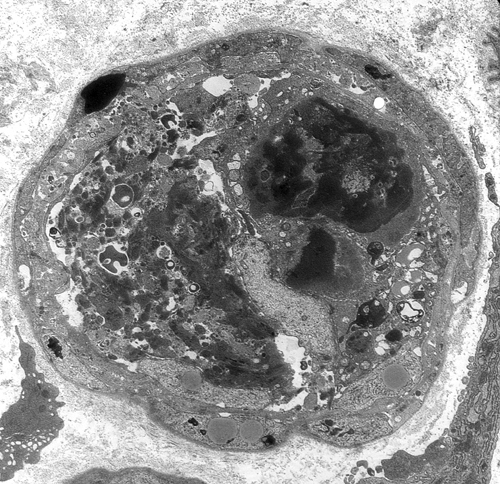 The inflammatory cells are in the endomysium (between and around individual myofibers.) Inflammation may be focal and the MRI is useful in identifying affected areas for biopsy. Dermatomyositis affects children and adults and is the most common inflammatory myopathy in children. It presents subacutely with muscle pain, weakness, and stiffness, and causes also a purple (heliotrope) discolorarion of the upper eyelids, edema around the eyes and mouth, facial erythema, and erythematous scaly papules over the knuckles and elbows (Gottron’s sign). Contractures, subcutaneous calcification, intestinal ulceration, and other extramuscular manifestations are frequent in children. The pathology of dermatomyositis includes inflammation, vasculitis, and perifascicular atrophy. The inflammatory cells are predominantly B-cells (with smaller numbers of CD4-positive T-cells) and are found around blood vessels, in the septa between muscle fascicles, and in fibroadipose tissue around muscle. The key pathological change of dermatomyositis is a vasculitis, which involves endomysial and perimysial capillaries and arterioles. This vasculitis begins with endothelial swelling and is followed by endothelial necrosis and capillary loss. 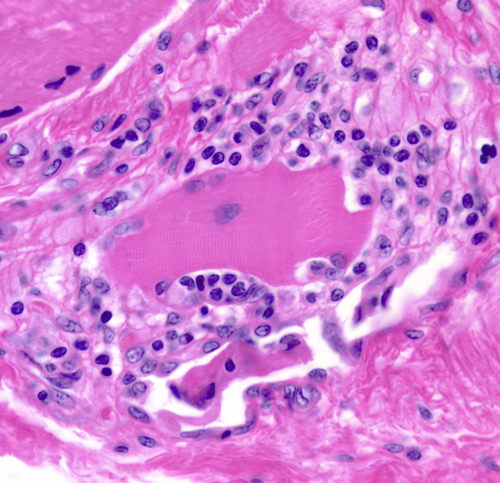 Tubuloreticular cytoplasmic inclusions (TRIs) are often seen in endothelial cells. TRIs also occur in lupus and other collagen vascular diseases but are absent in polymyositis and inclusion body myositis. The vasculitis is thought to be caused by circulating anti-endothelial antibodies. Interaction of these antibodies with vascular antigens activates complement, leading to formation of the membranolytic attack complex (MAC), which destroys endothelial cells. Dermatomyositis. Perifascicular atrophy. ATPase stain. 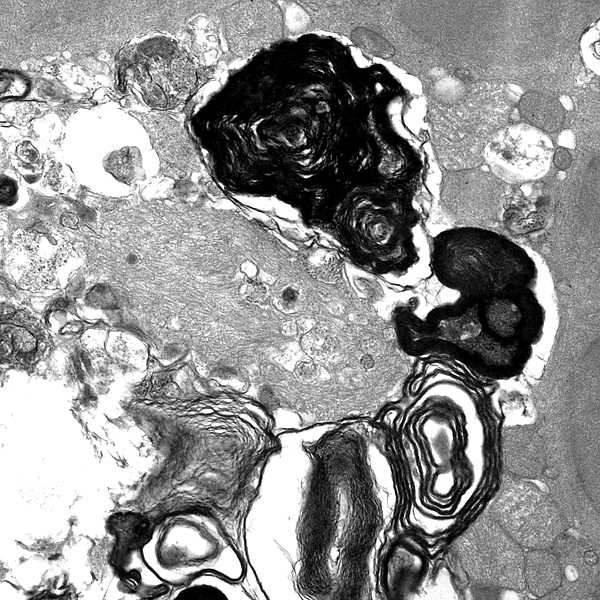 A distinctive feature of dermatomyositis is atrophy and degeneration of myofibers at the periphery of fascicles (perifascicular atrophy-PFA), which occurs even in absence of inflammation. It has been proposed that PFA is caused by ischemia from loss of the endomysial capillary bed. This affects more severely the distal portion of the vascular field, which is the periphery of each fascicle. In support of this hypothesis, ischemic infarction of muscle is seen in some cases of dermatomyositis. However, PFA is not seen in diabetic and other angiopathies. Recent evidence indicates that the CD4-positive cells in dermatomyositis are plasmacytoid dendritic cells. These cells secrete type 1 interferons, which induce genes and molecular cascades that cause muscle injury. A key interferon-induced pathology is deficiency of titin, an intramuscular protein that is a scaffold for contractile filaments. It is now thought that diffusion of interferons in the perifascicular areas causes the PFA. Dermatomyositis and polymyositis (and less frequently inclusion body myositis) are associated with scleroderma, mixed connective tissue disease, and cancer. The association with cancer is stronger with dermatomyositis. Patients with polymyositis and dermatomyositis may also have cardiac involvement leading to arrhythmia and heart failure, arthralgia, Raynaud's phenomenon, interstitial pneumonitis, and renal involvement. Some of these extra-muscular manifestations are associated with circulating antibodies to anti-Jo-1 (an anti tRNA synthetase) autoantibodies. Mixed connective tissue disease. 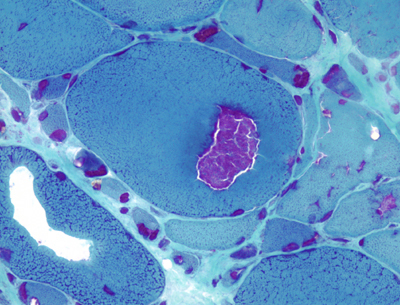 Inflammaton in muscle tissue and in the connective tissue septa between muscle fascicles. The muscle biopsy in systemic lupus erythematosus and other connective tissue diseases (CTD) shows most often interstitial perivascular mononuclear infiltrates without vascular injury or myonecrosis. In some patients, however, manifestations of CTD overlap with inflammatory myopathy. This combination has been called mixed CTD, undifferentiated CTD, diffuse CTD, the overlap syndrome, and systemic rheumatic disease. Patients with mixed CTD have muscle pathology that closely resembles dermatomyositis. The inflammation of polymyositis, dermatomyositis, and collagen vascular disease subsides rapidly with corticosteroids, so the biopsy should be done before treatment is started. IBM. 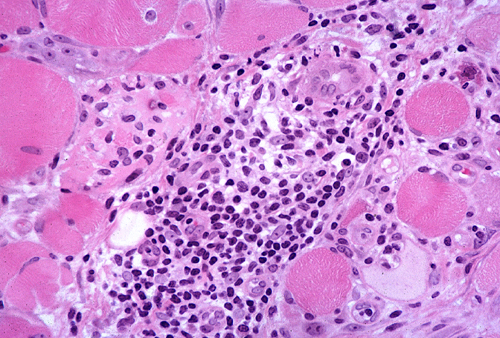 Vacuoles rimmed with basophilic granules. IBM. Vacuole filled with granules. Modified Gomori trichrome stain. Sporadic inclusion-body myositis (s-IBM) is the most common muscle disease in old people. It has an insidious onset and causes slowly progressive proximal and distal weakness with mild CK elevation. The pathology of s-IBM is highly characteristic and combines inflammation and myofiber degeneration. The inflammation is similar to polymyositis with cytotoxic (CD8-positive) lymphocytes invading and destroying myofibers. The degenerative changes consist of accumulation of myelinoid bodies and amyloid deposition. 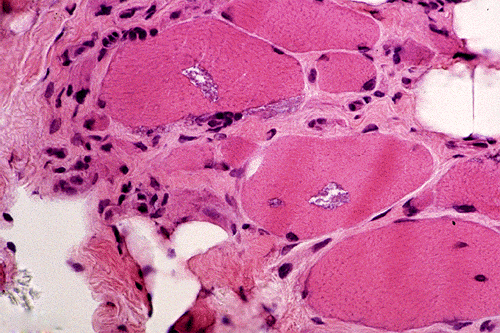 Affected myofibers have vacuoles or cracks, which contain basophilic granules. These are best seen in cryostat sections stained with modified Gomori trichrome. The granules consist of myelinoid membranous bodies. In or near the vacuoles there are small chunks of amyloid that can be detected with Congo Red stains. With electron microscopy, the amyloid deposits contain paired helical filaments similar to the neurofibrillary tangles of Alzheimer's disease and straight filaments. The filamentous inclusions of s-IBM contain beta amyloid, hyperphosphorylated tau protein (best detected with antibodies to SMI-31), apolipoprotein E, presenillin 1, prion protein, α-synuclein, and other proteins. Some of these are the same proteins that accumulate in the brain in neurodegenerative diseases such as Alzheimer's disease and Parkinson’s disease. Ragged red fibers and Cytochrome C-negative fibers are present in s-IBM with higher frequency than similar age individuals without s-IBM. The pathogenesis of IBM is not known but probably involves abnormal protein processing associated with ageing of myofibers, and the deposition of toxic protein polymers that damage myofibers and trigger inflammation. S-IBM is refractory to immunosuppressive therapy that is used in other inflammatory myopathies. There are hereditary myopathies with similar myofiber changes but without inflammation. The pathogenesis of s-IBM is not known but probably involves abnormal protein processing associated with ageing of myofibers, and the deposition of toxic protein polymers that damage myofibers and trigger inflammation. S-IBM is refractory to immunosuppressive therapy that is used in other inflammatory myopathies. There are hereditary myopathies with similar myofiber changes but without inflammation. The diagnosis of PM, DM, and IBM should be based on the biopsy findings. PM and DM are treated with corticosteroids. Azathioprine , methotrexate, and cyclosporin are used in severe cases. IBM is refractory to corticosteroids and immunosuppressive agents. Myasthenia gravis is an autoimmune muscle disease characterized by progressively increasing weakness with exertion and recovery of strength with rest or following administration of anticholinesterase drugs such as neostigmine. Weakness affects most severely muscles that are innervated by brain stem nuclei, such as extraocular and facial muscles, and causes drooping of the eyelids, diplopia, and inability to chew. Death is due to respiratory compromise. 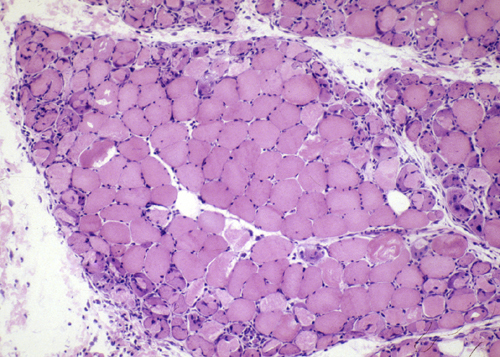 Pathologically, the muscle is either normal or shows myofiber atrophy and aggregates of lymphocytes in the endomysium. In severe cases, there may be myonecrosis. 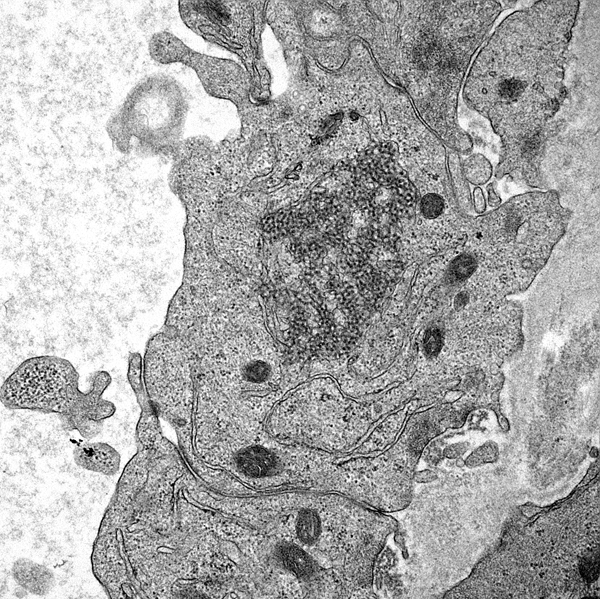 Electron microscopy shows abnormal motor end plates. Axon terminals are normal and the number of synaptic vesicles is adequate, but there is loss of post-synaptic membrane such that the post-synaptic region is simplified, showing a few wide folds without branching. The primary synaptic cleft is widened. Ten percent of patients with myasthenia gravis, especially older males, have thymomas, and most other patients have follicular hyperplasia of the thymus. Myasthenia gravis is caused by antibodies to the acetylcholine receptor (AChR) protein. Circulating IgG antibodies bind with the AChR and prevent acetylcholine from reacting with it. These antibodies also cause degradation of AChR and lysis of post-synaptic membranes. Improvement of strength following administration of edrophonium (Tensilon test) or neostigmine are diagnostic. Treatment consists of anticholinesterase drugs, corticosteroids and thymectomy. This course was produced for the use of students, residents, and staff of NEOMED and affiliated hospitals.